Click HERE to order our new cookbook, The Chubby Vegetarian: 100 Inspired Vegetable Recipes for the Modern Table (Susan Schadt Press, November 2016). 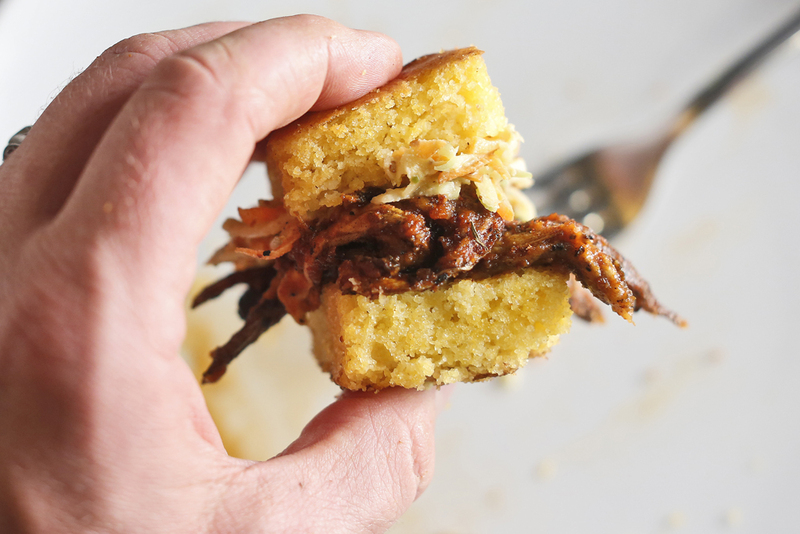 The book features two delicious BBQ recipes that you need right now. Clint, my buddy who’s also the editor of grilling.com, was kind enough to ask us to write a guest post, and we are thrilled to be here. Let me give you a quick intro about who we are and then we'll get right to it: some really good food. We’re Justin Fox Burks and Amy Lawrence, bloggers at The Chubby Vegetarian. We’re a husband-and-wife team out of Memphis, Tennessee, and we have a new cookbook out called The Southern Vegetarian: 100 Down-Home Recipes for the Modern Table (Thomas Nelson, 2013). Our goal is not to take your bacon away, but to show the world all the great meals that are possible with vegetables. We want to help you take vegetables from the side dish to center of the plate, and we do that by thinking in a whole different way. This pulled eggplant dish uses an ancient method of cooking eggplant by charring the skin, which imparts a smoky flavor and a meaty texture to the dish -- much like roasting a red pepper over an open flame. From there, we remove some of the moisture and spice it with our Memphis BBQ Dry Rub, and last, we toss it with some smoky, sweet BBQ sauce. It may just be the best eggplant you'll ever put in your mouth. 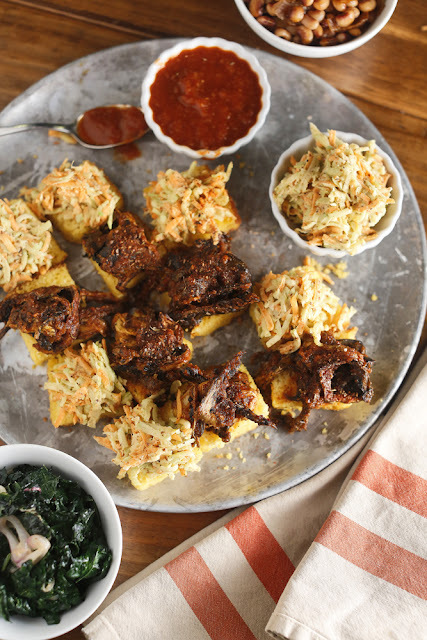 Once you've prepared our Pulled Eggplant BBQ, you can serve it any way you'd like: on a bun, over spaghetti tossed with BBQ sauce, or our current favorite, on squares of freshly-baked cornbread with a little slaw and extra sauce. This recipe serves 2 to 4 folks, but if you have more to feed, just double or triple the recipe. Thanks for hanging out with us and enjoy the recipe! Char the whole eggplants over the open flame of your burner or on a very hot grill until the skin is black and flaky and the eggplant has begun to collapse. This will take about 10 minutes of total cooking time. Remove eggplants and place into an airtight container until thoroughly cool. Peel eggplant by running your hand down the length of the eggplant to remove the charred skin. Discard skin and remove the top part that was connected to the vine. Create strips from the eggplant by peeling the flesh into 6 to 8 pieces. It comes right apart with the grain of the eggplant. On the trays from your dehydrator or a parchment-lined baking sheet, arrange the strips of eggplant in a single layer. Apply the dry rub liberally to the strips of eggplant. If using the dehydrator method, simply set the timer for 1 hour at 125 degrees. If you’re using the oven, set the temp to the lowest possible setting, prop the oven door open, and set the timer for 40 minutes. Mix together one teaspoon of each: chipotle, smoked paprika, sweet paprika, garlic powder, salt, cumin, black pepper, brown sugar, thyme, oregano, and ancho chili. Store extra dry rub in an airtight container for up to six months. My job as a photographer takes me to some really interesting places. 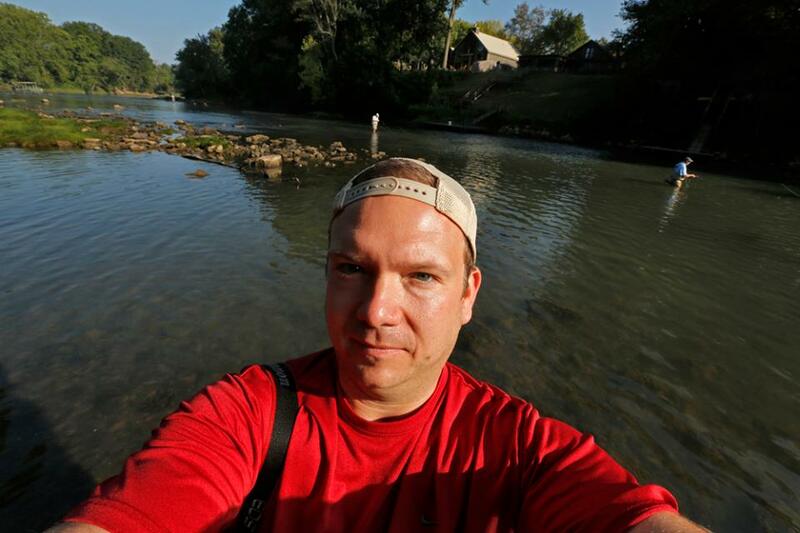 Recently, I was wading hip-deep out onto a rocky shoal to capture fly fishermen outside Heber Springs, Arkansas. That night I stayed at the cabins at Fat Possum Hollow on a beautiful piece of land tucked between Sugarloaf Mountain and some smaller foothills. Dinner in the barn that night was simply salad, potatoes, pork chops for most and there was a flame-grilled portobello mushroom for me. It was perfect. The whole experience of being out in nature and the unfussy, shared meal with friends both old and new got me thinking about simplicity -- and the lack of it in my life. It was one of those Thoreau-esque moments, y'all. I don't need that kind of uncomplicated existence all of the time, but it sure is nice to visit it every once in a while. Luckily, this vegetarian version of a classic meat-and-potatoes dish can transport me back to that state of mind anytime I want. I've not spent this little time preparing a meal in a while. You barely need a knife to prepare it, and in fact, there is almost no prep at all. In a small bowl, mix the porcini salt, paprika, garlic, thyme, red pepper, and black pepper. Set the dry rub aside. Drizzle olive oil and sherry vinegar onto both sides of the mushrooms and then coat generously in the dry rub; reserve about 1/3 of the rub. 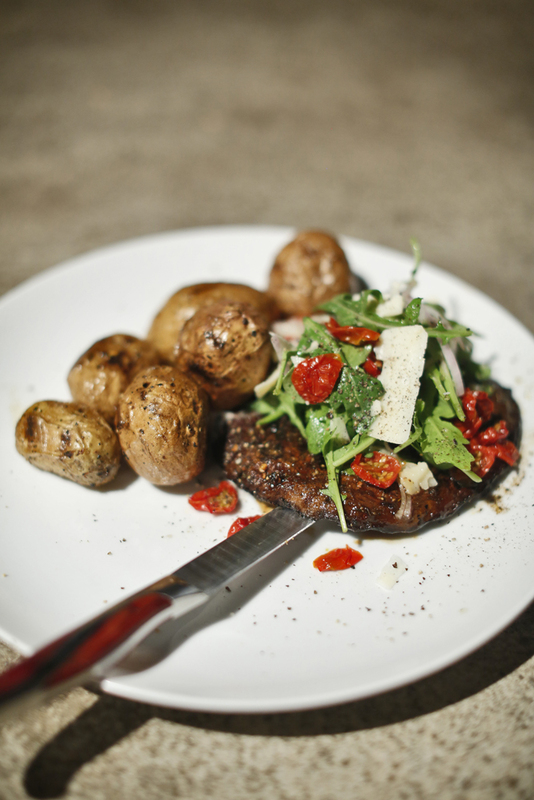 Set mushrooms aside in the fridge for at least 30 minutes or until ready to grill. Place potatoes onto a baking sheet. Preheat your oven to 350 degrees. Drizzle clean potatoes with olive oil and sprinkle with the remaining dry rub. Place potatoes into the oven for 30 minutes or until tender. Remove and set aside. Just before you are ready to eat, preheat the outdoor grill to high. Grill mushrooms for about 5 minutes per side or until well-marked by the grill grates. Toss cooked potatoes onto the grill to warm them through. Place the lemon juice, honey, olive oil, salt, and pepper into a jar, close the lid, and shake. Set aside until ready to use. We've been covered up in cucumbers, dealing with a ton of tomatoes, and processing a peck of peppers. It's the time of year when the garden is in full swing -- but so is work. There is so much to do and not a whole lot of time available to do it. Still, we pick vegetables, and we're compelled to roast, pickle, ferment, and freeze the best of the season so that we can enjoy homegrown everything all year long. (Thomas Nelson, 2013), we now know that it's also stellar grilled. 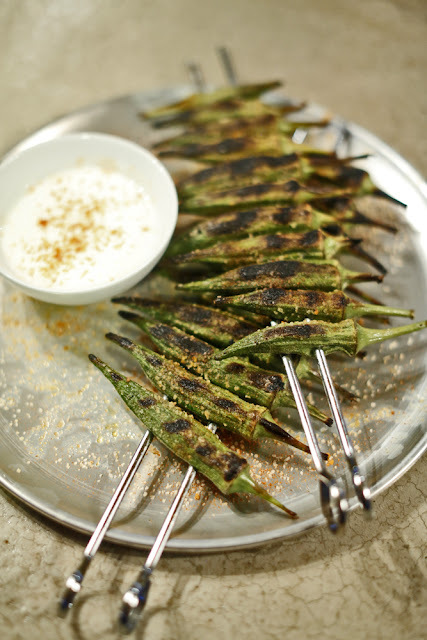 We took her method and twisted it a little by switching out the Cajun seasoning for Ethiopian berbere spice and dipping the grilled okra in some thinned ricotta, which is similar to the fresh cheese served with Ethiopian dishes. This is a simple winner when okra appears in your C.S.A. or your friendly neighbor drops by with a pint or two from his bumper crop. Preheat the outdoor grill to high. In a large bowl, toss the okra with the oil and vinegar to coat. Thread okra onto skewers and season generously with the berbere spice and salt. Grill 3 to 4 minutes per side or until well marked by the grill grates. Remove from the grill and set aside. 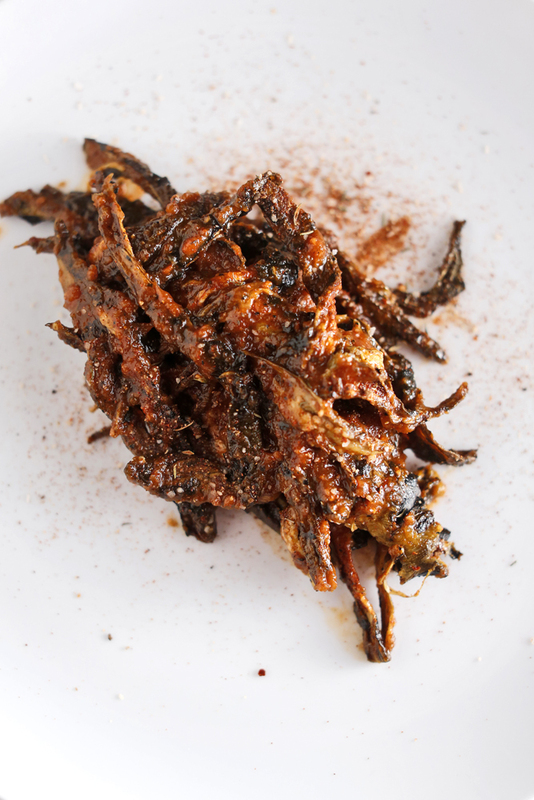 *Make your own using Marcus Samuelson's recipe and omit the salt. 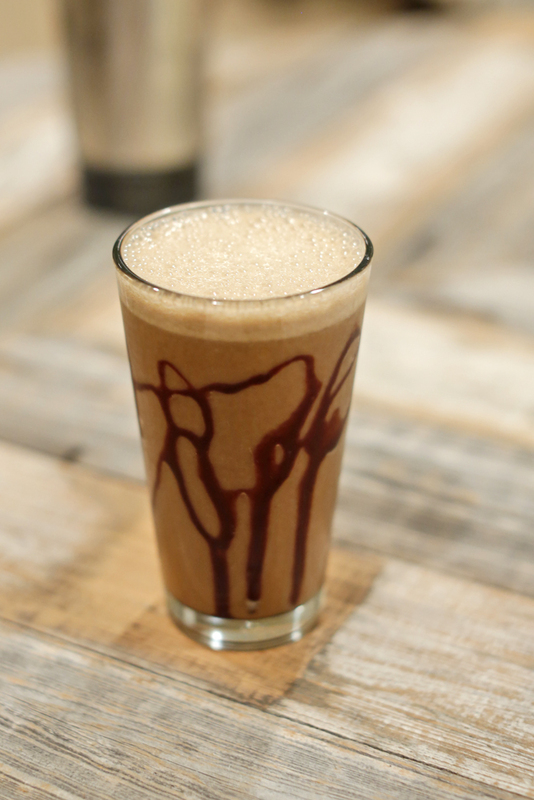 This smoothie was made out of necessity one morning when nothing was going right. Around here, a trying morning usually involves one of the following minor annoyances: realizing that we've run out of something important, an appliance not working or suddenly breaking, or a minor injury due to sleepiness/carelessness. Well, on this particular morning, we had all 3 of these things go wrong in the space of about 5 minutes. So. Only one thing would fix this mess: some coffee. Not able to fix it any of the usual ways, I busted out the blender and figured I'd make do by using some instant espresso powder I had in the baking supplies box. I'd make this smoothie again even if I wasn't in a pinch! I thought while I dashed around getting ready and drinking it up that day. It saved the whole morning. We grew up with Carolyn and her sweet family, so when we heard about all that she and the folks at the Church Health Center in Memphis are doing to help people get their home cooking on the right track, we had to know more. She and the staff at the CHC have a new cookbook out with some recipes we really want to try, including Carrot Soufflé, White Cheddar Herbed Grit Cake over Mixed Greens with Honey-Fig Vinaigrette, and also the Whole Grain Breakfast Quinoa, for starters. 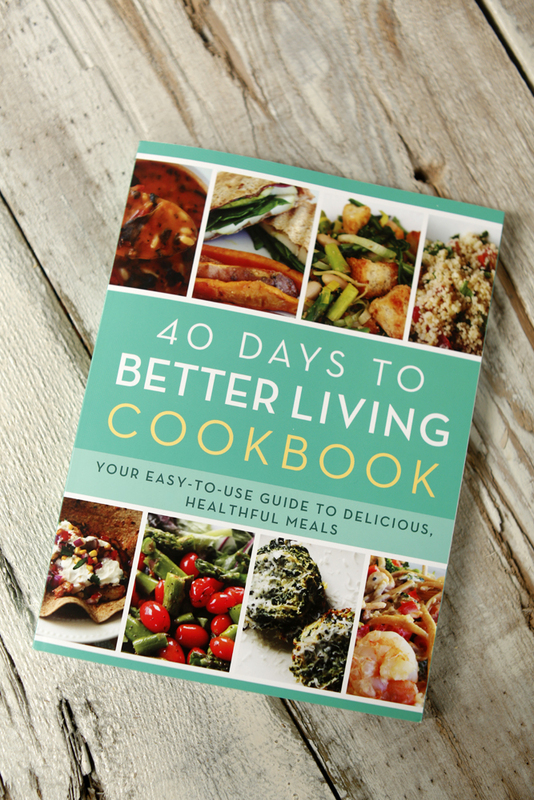 Learn more about and order the 40 Days to Better Living Cookbook HERE and check out our interview with Carolyn below! Here's more about the cookbook straight from the source. Carolyn Nichols: Basically, our cookbook puts a healthy spin on traditional favorites. We try to use items and products everyone has heard of, and everything we purchase comes from Kroger, so it's easily accessible to all. We put the the nutritional analysis and the cost on each recipe. There is no author listed for the book because it was truly a group effort. I came up with about 70% of the recipes, the other 30% of the recipes are from other CHC staff members and interns, our dietician did the nutritional analysis, lots of staff tested and proofread the recipes, and our PR team took on the task of working with our publisher. 1. TCV: What do you do at the Church Health Center here in Memphis? CN: I teach healthy cooking classes to adults, teenagers, and children. I health-coach new and established CHC Clinic patients. 2. TCV: What are a couple of easy changes folks can make to their diets for a big impact when it comes to health? CN: We talk about easy changes daily in our classes. Some of our favorites: use less cheese, switch from whole milk to low fat or skim milk, measure your fats, switch from salt to herbs and spices, drink more water, eat fruit or yogurt for dessert on the weekdays and save the ice cream/cake/cookie type treats for the weekends. The main thing we want our participants to take away from the class is the proper serving size of a food item. We focus on serving size because even though a recipe is healthy, it still has calories, so we don't want to eat the entire dish! 3. TCV: Favorite healthy dinners for people who are in the middle of busy August back-to-school time? CN: Favorite healthy dinners for back to school: quesadillas, easy pasta dishes, and stir-frys! There are several in the cookbook. All three of these items can be made quickly, and lots of veggies can be thrown in. My favorite from the cookbook: shrimp etouffee, grilled eggplant quesadillas, and the tomato and eggplant pasta. All 3 of these recipes can be done in 45 minutes or less. 4. TCV: What was it like to work on the 40 Days to Better Living Cookbook -- and do you and your family (or your co-workers) agree on a favorite recipe in it? CN: It was a learning experience for sure working on a cookbook. I didn't know what all went into preparing one. It was fun, though, and made me closer to my coworkers. It was fun having testing days in the kitchen were we would invite staff, family, and friends in the kitchen to test recipes. Those days were my favorite days of getting the cookbook ready. My family's favorite recipe is the shrimp cakes with avocado salsa. It's a light and fresh recipe that's great for summer. My kids' favorite is the banana bread and the delicious granola with cherries and raisins. 5. TCV: Okay, just as soon as I heard you talk about it, I had to know more: how do you make your to-go breakfast, oatmeal in a jar? This is the particular kind of awesome that comes from brainstorming with a chef like Andrew Adams of Acre Restaurant. While working on a menu for our upcoming Arts Memphis Culinary Series Dinner, we started discussing items that would be great on a shared plate. We started talking about curing, compressing, and drying and what these processes would do the the texture and appearance of different fruits and vegetables. (I know: from this, you are able to gather that we're both unbearably exciting, right?) He landed on a date jerky, and I wanted to try a cured watermelon. A few days later, Andrew sent me a link to the Studio Kitchen blog recipe, which uses kombu, a type of dried seaweed very high in glutamate, the substance that is responsible for umami and used to cure fish. I decided to give it a shot with watermelon that I had dehydrated enough to give it a concentrated flavor and a meaty texture. I love it! 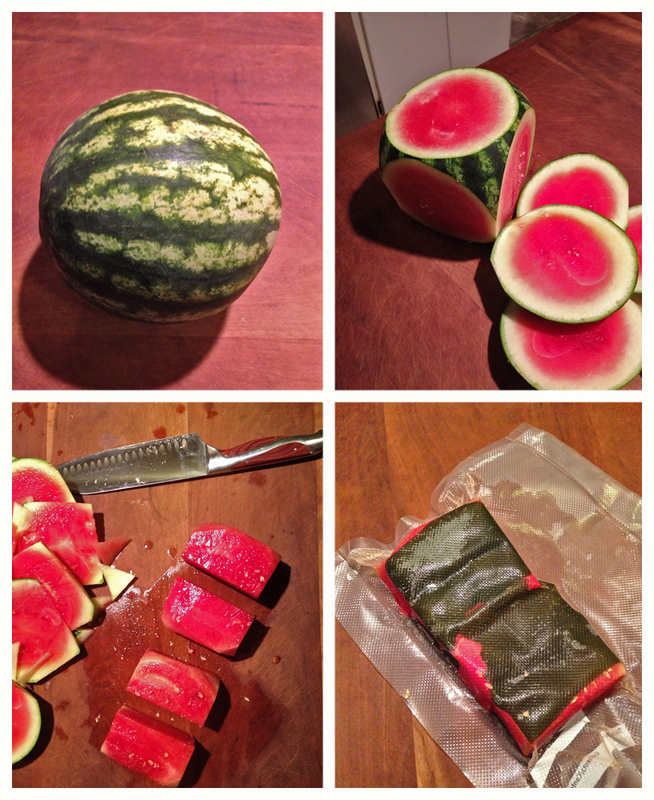 Cut the watermelon into a large square by trimming off all of the sides to reveal the heart. Trim off any rind that remains. Cut into 2" x 2" x 4" blocks -- you should get 4 from a small watermelon. Place watermelon blocks into a 125-degree dehydrator for about 4 hours until the short side has reduced by roughly half; at this point, it should measure just over 1". 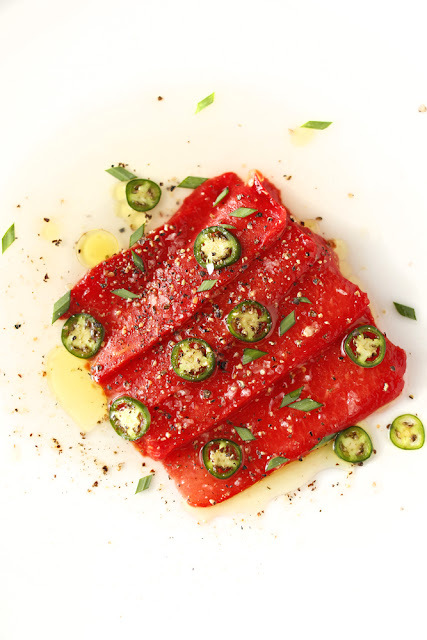 Briefly rinse kombu under cold water and place along the top and bottom of the dehydrated watermelon. Either vacuum seal or place into an airtight container in the fridge overnight. We've already made a variation of this great chocolate-zucchini-pumpkin bread recipe three times this month after a search for a zucchini and pumpkin combo led to A Hippie with a Minivan. We turned it into muffins, though. And deleted the chocolate chips. And added some oil. You know how it goes. We thought of it like cupcakes plus vegetables and topped it with some dark chocolate and cream cheese frosting for a family dinner this summer. Making do with what you have and getting done what you need to get done no matter what the weird circumstances are...those are our goals this week. We've had to get a little creative recently since our little kitchen pretty much went off the rails this week. It's so sad! We can handle one minor calamity at a time, no problem -- like when water from the kitchen faucet got ahold of a light electric charge one Friday afternoon a few months ago. Hand washing was very odd all of a sudden, not unlike an at-home nerve block. Got that mess fixed up right away. But this week, in the space of a few days, it's one thing after another in the kitchen -- lighting, faucet, oven all going haywire -- sort of a lot at once. We're working on it and can't wait for normal to make its way back here. When you're a healthy mix of stubborn and resourceful, though, in the face of some overwhelming broken-down-kitchen business, you find a way to make muffins anyway. And then you use the same basic batter to make Sunday morning pancakes. A surprise: they turned out even better the second way, and as a bonus, used up some summer zucchini.